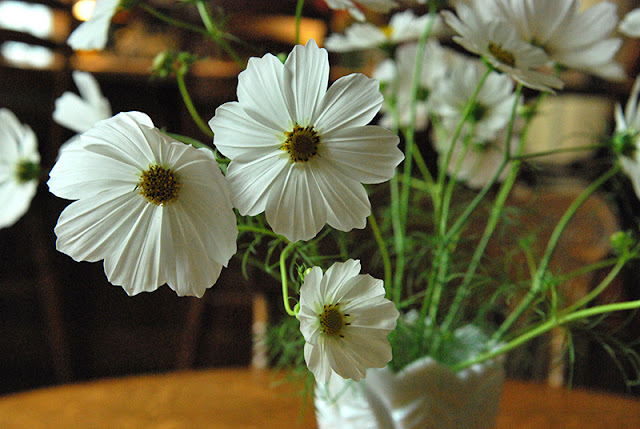 White Cosmos: Graceful and Simple - Jill Ruth & Co. The cosmos in the garden began to bloom a couple of weeks ago and these white ones are just so so pretty! I decided to catch them in the early morning light. This is the first our dining room table has been cleared off for WEEKS! 4h projects, apartment hunting for two of our kids, moving our daughter, and family events have been keeping us away from house chores. We have purple and pink ones blooming too and I put them in another arrangement. It's the white ones though that really grab my attention. The cosmos have such a gracefulness to them. 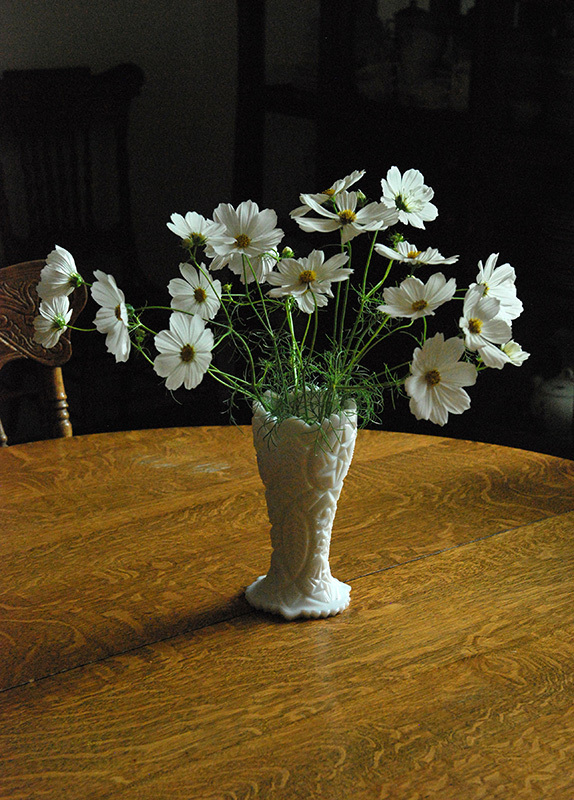 I think they are wonderful in the vintage white milk glass vase. I picked that up at an estate sale a couple of years ago. The seed packet we had was a combination of colors, so I think I'll order a packet of all white next year. While I was looking I found these double click snow puff white cosmos seeds too! I've pinned them so I don't forget them. Hopefully, the next blog post won't be so long in coming...Be sure to check the sidebar for the Instagram feed to see what else has been going on here. 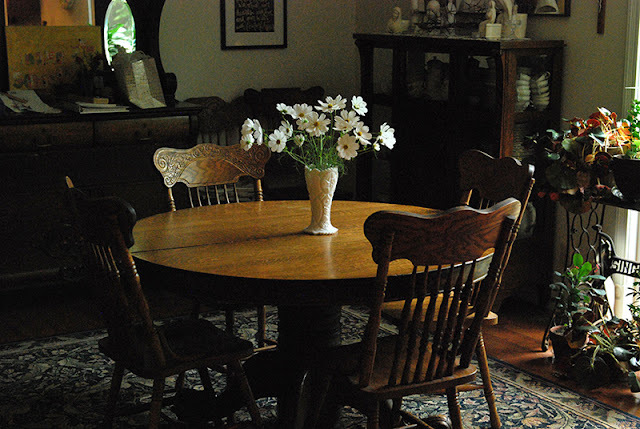 Your cosmos look lovely in your dining room - like pinpoints of light. I used to have cosmos in my garden that self seeded. None came up this year so I guess I'll have to put in some new seeds next summer. 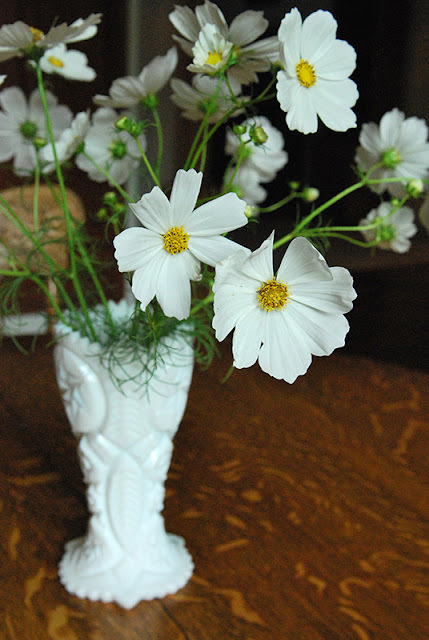 I love Cosmos and definitely perfect in the Milk Glass Vase. Zinnias and Cosmos are my favorites! Didn't get any planted this year. Thanks for sharing yours!